The Antonia’s Friends team completed the Race Across America 2017 in 7 days, 11 hrs; raising over £15,000 for Asthma UK. An incredible effort. With these wonderfully frank words of encouragement fresh in their minds, the 2017 Antonia’s Friends team set out on their quest to Race Across America in under 8 days. 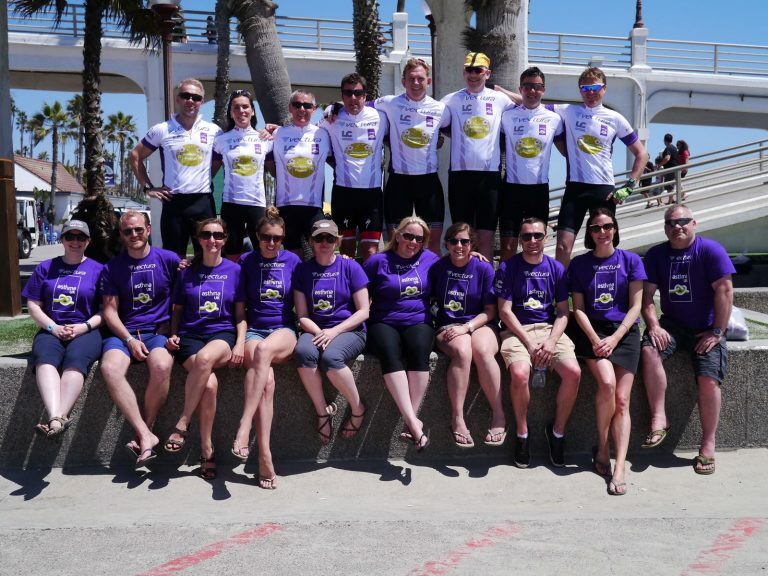 Over the following week, the team, stewarded by Leadership Challenges, cycled non-stop from the Californian west coast, through 12 states, to the east coast of Maryland, to cover 3,000 mile race distance. The route crews provided vital roadside support, guiding the team along the race route, navigating the numerous route changes, supplying endless energy-boosting meals and team spirit to keep the two 4-man relay pods moving towards the race end. Within the first 24 hours, personal speed records had been smashed as Antonia’s Friends kept the wheels turning on their epic challenge. RAAM 2017 experienced some of the most inclement weather conditions in recent race history with flash flooding, strong headwinds and massive golf ball-sized hailstones, causing severe disruption to progress, not to mention catastrophic damage to kit, equipment and vehicles. As the riders took cover, the road crew found themselves racing to exchange hire vehicles too damaged to continue. To see more pictures of RAAM 2017 click here. The weather hadn’t quite settled as flash floods caused yet further route changes in the final 24 hours of racing, but somewhat against the odds, and with one final push, Antonia’s Friends rolled across the finish line at Annapolis 7 days, 11 hours, after the start, having completed 3,143.8 miles, averaging 355.2 miles per day. All for a good cause, Antonia’s Friends endured sleep deprivation, relentless battering from the elements and pain for one very simple reason – to raise as much money as they could for Asthma UK. Every 10 seconds someone is having a potentially life-threatening asthma attack in the UK. Every day, the lives of three families are devastated by the death of a loved one to an asthma attack, and tragically two thirds of these deaths are preventable. During RAAM17, Antonia’s Friends has raised £15,605. For more details about the very personal story behind the team’s name and why they have made such monumental efforts, visit this page on our website. We would like to thank our sponsor and supporters who have come on our RAAM 2017 journey with us. Chippenham-based Vectura, industry leaders in inhaled drug delivery technology, who enabled two of its personnel to join Antonia’s Friends as navigators, Aoife O’Connor and Anita Milei. Also MyProtein, Budweiser Budvar and Redrow.